I have been in therapy, off and on, for the past six years. In hindsight, I would describe the younger Kathleen as anxious, worried, and concerned about the future. As I got older, I became a perfectionist; one of those over-achieving kids who never felt as though they were ‘getting it right’. In university I began to develop obsessive tendencies – tapping light switches five times, checking locked doors five times, pushing the fridge door closed five times. Always patterns of five. For a long time it was controllable so I figured it was normal. Besides, we all have our quirks. Many of us check all the burners on the stove before leaving the house, or feel the need to always carry hand sanitizer. So I figured I was just like everyone else. Besides, no one really told me otherwise. And maybe I was like everyone else; that is until my obsessive tendencies began to take over my life. I would avoid using the stove at times, needed to ask others to lock the front door for me, spent many sleepless nights worrying about mundane things like my work computer, a light switch I turned on at the office, or whether the kettle may sporadically catch on fire. At times, I had difficulty breathing, struggled with panic attacks, and became so ‘worked up’ that I needed hours to calm down. As much as it pained me to admit it, I was no longer like everyone else. It was no longer normal and I needed help. But, like so many others, my decision to seek professional help was a painstaking one. When someone is diagnosed with cancer, we describe them as ‘sick’ or ‘ill’, and approach them with empathy. We would categorize a broken leg as an ‘injury’, and offer to lend a helping hand. We donate, run, wear clothing, grow and cut our hair on behalf of many deserving physical illnesses. What do we do for those struggling with mental illness? We describe them as crazy, disturbed, deranged, insane, lunatics, ‘nuts’, troubled… the list goes on. In fact, a 2007 study has suggested that there are 250 labels utilized to negatively characterize mental illness. We have 250 ways to ridicule, fear, delegitimize, shame, and blame those diagnosed with schizophrenia, bipolar disorder, anxiety, many other diagnosable mental illnesses, and an array of mental health concerns. We stigmatize mental illness, and this very stigmatization causes those who struggle with mental health concerns to withdraw, disassociate, and isolate from others; all the while caught within an invisible struggle to regain ‘health’. The backlash so often associated with mental illness does not go unnoticed; many live in fear and choose instead to keep their challenges with mental illness secret from family, friends, and helping professionals. A worrisome 60% of us with mental illness may not seek out treatment resulting from concealment, lack of available treatment, or inability to pay for adequate intervention. Mental illness stigmatization is, according to the World Health Organization, “the single most important barrier to overcome in the community”. Imagine the outcry if the majority of those diagnosed with cancer were abstaining from treatment. Rarely a word is spoken when the illness is easily concealed. The horror of the Newtown tragedy brought to light the very stigmatization that parallels mental illness. Media outlets grappled to find any history of mental illness of those involved, and began jumping to conclusions once a ‘mental health related motive’ was rumored. Articles were written about the ‘obvious’ state of the perpetrator, and hazardous generalizations were made between experiences when little accurate information was ever provided. We are all looking for something to blame in order to make sense of our collective anger, sadness, and terror. However, by throwing blame in the wrong direction we cause further unintentional widespread harm. I waited to write this blog until some of the media-hype had dissipated. The reason for doing so is because by speculating on causes drawn from the shooter’s personal history we do little to de-stigmatize mental illness or to really come to terms with the tragedy. The reality is that we, the 1 in 4 Americans and 1 in 5 Canadians who struggle with a ‘diagnosable’ mental illness, are no more capable of violence than those lacking a mental illness. In fact, we are 2.5 to 4 times more likely to be victims of violence. This is what the media needs to start reporting, not sensationalizing difference, but embracing it so that we can become a more compassionate and tolerant society. Perhaps the perpetrator behind the Newtown tragedy did struggle with a mental illness. Maybe he was seeking psychological support, or was isolated. But perhaps he did not. The fact is we may never know. But what we do know is that to insinuate that me, or you, or someone you may know and love is to be feared, shunned, and discriminated against merely because they are battling a mental illness is dangerous. By doing so we are further perpetuating the very stigma that keeps so many from seeking help and support, choosing instead to battle significant health concerns on their own. To continue such negative speak will harm countless others and will do little to ‘add some good’ into an impossibly sad situation. 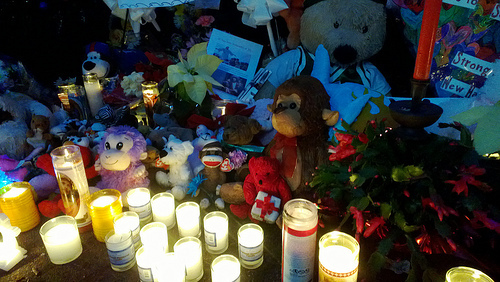 The people of Newtown have witnessed unspeakable horror and profound loss. If (and more than likely when) the children, parents, educators, first responders, health professionals, funeral assistants, and the entire community seek mental health assistance will we call them crazy? Disturbed? Troubled? Will we shame them for being weak, and blame them for their struggles? No, we’ll call them human. We’ll tell them it’s ok to ask for help. We’ll encourage them to talk, to cry, to be angry, and to work through every other emotion that may decide to surface. We’ll support them throughout their process and hope that, though they may never come to a resolution about what happened, they will be able to position themselves within a narrative that they understand, and one that allows some ‘peace’. And so we should do for the millions of us through North American who struggle with mental illness what we already do for those suffering from cancer, or diseases like it. As a collective, we need to call for mental health reform to ensure everyone can access affordable and adequate professional support, and improved mental health literacy to create new found awareness about what mental health is, and how we can best support others. Mental illness does not discriminate, so neither should we. In the wise words of President Clinton, “mental illness is nothing to be ashamed of, but stigma and bias shame us all”. When I sought out help I understood that I would be stigmatized, however I was lucky enough to have the supports in place that made that stigma less palpable. In 2013, let us all work to combat the stigmatization of, and lack of attention paid to, mental illness because at the end of the day health is health, whether its physical or mental, concealed or visible. Meet the fabulous women who have been providing stories, news, opinions and information to you for the past five years. Interested in cross-posting a piece or writing for Fem2? Check out our guidelines or email us for more information!